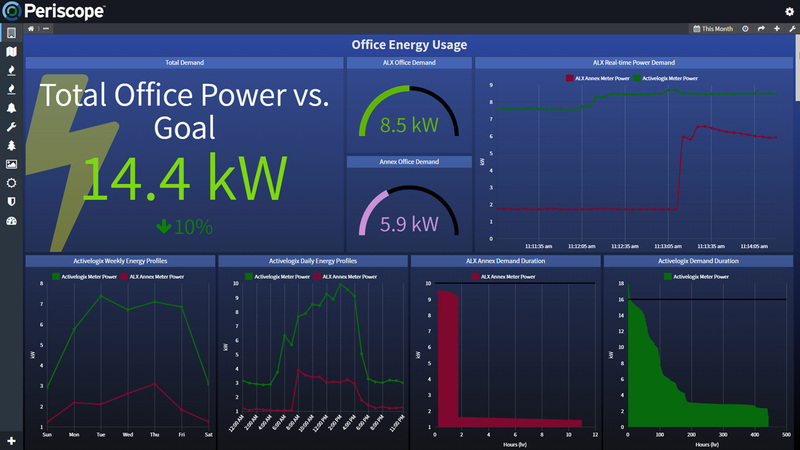 Last month we talked about specific ways to discover and resolve energy losses that are occurring in your buildings. As we learned, energy consumption can be analyzed many different ways and to different outcomes. Once Periscope is deployed in a university, facility, or office environment, it can be easily configured to suit the varied users that will be utilizing its results. Whether you’re a teacher in a classroom of a small school stressing the importance of conservation to your students, or the President of a large corporation analyzing the overall reduction in your building(s) energy usage, Periscope excels in presenting gathered data in a way that best fits the requirements of the intended consumer. Periscope allows for an unlimited number of users on a single license, making it more valuable than most applications as anyone in the organization with an approved login can see how their facility is performing. This month we’ll discuss several typical user types in varied industries and examine how Periscope can be an invaluable energy analysis tool within any organization. Business or property owners want an overall understanding of how their buildings are providing comfort and consuming energy for employees or tenants. 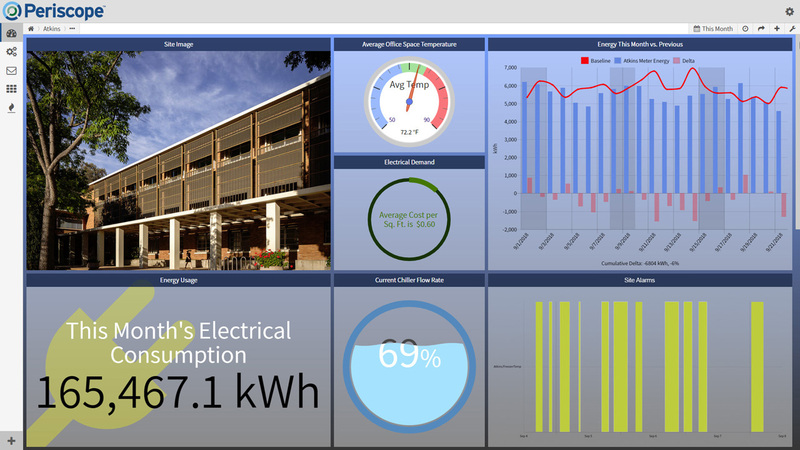 Property owners might not need to know specific details such as particular equipment fan speeds or what time on Wednesday building lighting systems are supposed to turn on, but they need to be assured that agreed upon environmental and energy metrics are being met. Property owners will most likely be after the ‘bigger picture’: How much energy overall was used this month vs last month? How do different floors in their building or different buildings on their campus compare with each other in consumption? What are the normalized utility costs of their facility based on square footage or weather patterns? The standard Tree Map or Scatter Plot Views present these normalized concepts/points clearly. 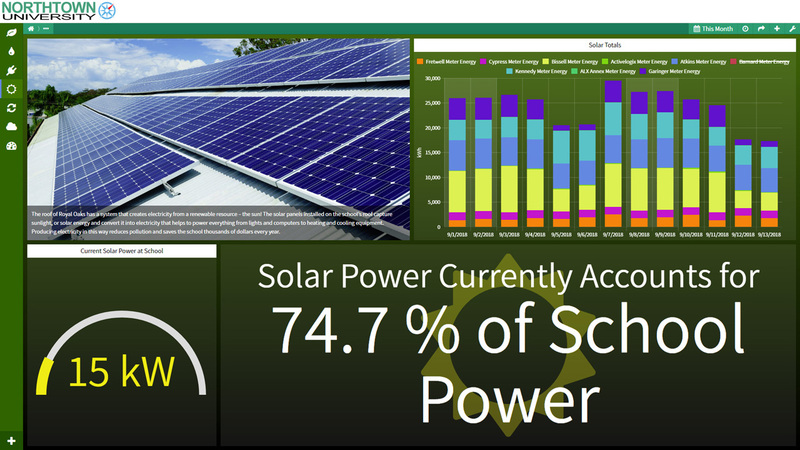 Big picture observations make it easier for property owners to understand what energy managers and sustainability directors are achieving or battling and whether funding is needed or generating a return on investment. Periscope offers coherent and up-to-the-second measurements across a portfolio of buildings or at a single facility, informing staff and occupants that buildings are performing to expectations, or need improvements. Performing audits to evaluate energy use, costs, efficiency initiatives. Applying for Leadership in Energy and Environmental Design (LEED) accreditation by contributing towards greater performance in the Energy and Atmosphere category, which has the highest point total in a project checklist by sharing data via our ENERGY STAR driver. – Was the AC system running over the weekend? – Were lights left on in the conference room? – Is a scheduling application energizing the whole building when one person is working late? These periods of energy use quickly become apparent in an otherwise repetitive pattern of colors over the course of a week or month. 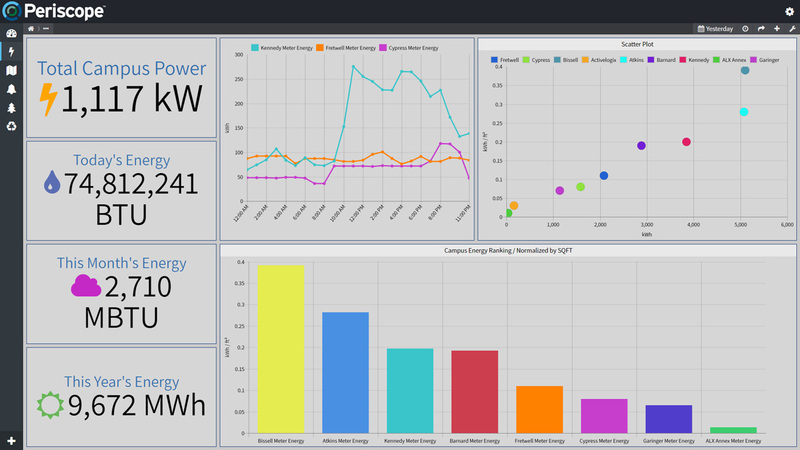 Utilize the Baseline Comparison Vewlet to compare how your building’s energy consumption compares to a prior time range. Whatever view or viewlet you choose to use, Periscope gives you granular control over how to organize and display important metrics to optimize efficiency, and reduced costs. As a property manager, one of your main goals is confirming the comfort of your tenants. What are the thermostats setpoints? Are the lights coming on at the scheduled time? Are there any upcoming events that would require halls or boardrooms to be comfortable and ready to accept people for a meeting or conference? You may confirm building automation settings and schedules through Periscope’s user interface to make sure the lights are coming on, and the temperature is set for the big day. Look back on how tenants have utilized resources over days, months, and years or track real-time metrics, so you can stay in the know and anticipate future needs or discuss excessive after-hours usage. With Periscope, you can be assured that the HVAC system is performing as designed and providing tenants with clean, comfortable, and reliable air conditioning. If parameters indicate that it might need servicing, you have the power to plan maintenance requirements for minimal tenant disruption and downtime. Finding problems before they need to be corrected can also save the property investor money. As a sustainability director, it’s important to analyze and predict your institution’s current resource usage and future environmental impact. Periscope is a powerful yet approachable tool that enables time-based comparisons between campuses, buildings, and departments. Set up a kiosk in a cafeteria or lobby with the Green Tips Viewlet enabled: You have the power to show the general public the importance and success of your initiatives and show why conservation is important in society. Suggest a ‘Power Down Day’ to raise awareness or kick off a friendly competition between freestanding dormitories on campus, floors in the office, or offices across the country to see who can use the least amount of water/electricity over a given time period for prizes or bragging rights. Conservation efforts don’t have to be boring! For those responsible for providing an ongoing evaluation of an organization’s profits, personnel, and ecological outlook, Periscope excels in fostering improved awareness. Whatever your role is in your industry, if monitoring, saving or improving energy or natural resource consumption is a part of your job description, Periscope is the easy and intuitive product to use for success! Want to learn about how Periscope can be used to communicate/teach visitors or students the merits of saving energy? Watch for us next month for Part 4 of our discussion on Methods to Simplify Technical Energy Concepts for the Public.